Preface. Numerical methods for ordinary differential equations in the 20th century (J.C. Butcher). Initial value problems for ODE's in problem solving environments (L.F. Shampine, R.M. Corless). Resolvent conditions and bounds on the powers of matrices, with relevance to numerical stability of initial value problems (N. Borovykh, M.N. Spijker). Numerical bifurcation analysis for ODEs (W. Govaerts). Preserving algebraic invariants with Runge-Kutta methods (A. Iserles, A. Zanna). Performance of two methods for solving separable Hamiltonian systems (V. Antohe, I. Gladwell). Order stars and stiff integrators (E. Hairer, G. Wanner). Exponentially fitted Runge-Kutta methods (G. Vanden Berghe, H. De Meyer, M. Van Daele, T. Van Hecke). Modified extended backward differentiation formulae for the numerical solution of stiff initial value problems in ODEs and DAEs (J.R. Cash). Software and algorithms for sensitivity analysis of large-scale differential algebraic systems (S. Li, L. Petzold). Compensating for order variation in mesh refinement for direct transcription methods (J.T. Betts, N. Biehn, S.L. Campbell, W.P. Huffman). Continuous numerical methods for ODEs with defect control (W.H. Enright). Numerical solutions of stochastic differential equations - implementations and stability issues (K. Burrage, P. Burrage, T. Mitsui). Numerical modelling in biosciences using delay differential equations (G.A. Bocharov, F.A. Rihan). Dynamics of constrained differential delay equations (J. Norbury, R.E. Wilson). A perspective on the numerical treatment of Volterra equations (C.T.H. Baker) Numerical stability of nonlinear delay differential equations of neutral type (A. Bellen, N. Guglielmi, M. Zennaro). Numerical bijurcation analysis of delay differential equations (K. Engelborghs, T. Luzyanina, D. Roose). How do numerical methods perform for delay differential equations undergoing a Hopf bifurcation? (N.J. Ford, V. Wulf). Designing efficient software for solving delay differential equations (C.A.H. Paul). Introduction to the numerical analysis of stochastic delay differential equations (E. Buckwar). Retarded differential equations (C.T.H. Baker). Adaptive space-time finite element solution for Volterra equations arising in viscoelasticity problems (S. Shaw, J.R. Whiteman). CP methods for the Schrödinger equation (L.Gr. Ixaru). Asymptotic correction of Numerov's eigenvalue estimates with natural boundary conditions (A.L. Andrew). Numerical methods for higher order Sturm-Liouville problems (L. Greenberg, M. Marletta). On a comuter assisted proof of the existence of eigenvalues below the essential spectrum of the Sturm-Liouville problem (B.M. Brown, D.K.R. McCormack, A. Zettl). Numerical analysis for non-dimensional Cauchy singular integral equations (P. Junghanns, B. Silbermann). Numerical methods for integral equations of Mellin type (J. Elschner, I.G. Graham). Quadrature methods for 2D and 3D problems (A. Rathsfeld). Qualocation (I.H. Sloan). A sparse H-matrix arithmetic: general complexity estimates (W. Hackbusch, B.N. Khoromskij) Multilevel methods for the h-, p-, and hp-versions of the boundary element method (E.P. Stephan). Domain decomposition methods via boundary integral equations (G.C. Hsiao, O. Steinback, W.L. Wendland). Author Index Volume 125. 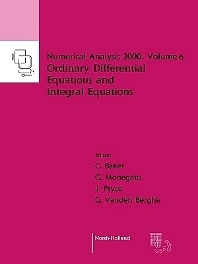 This volume contains contributions in the area of differential equations and integral equations. Many numerical methods have arisen in response to the need to solve "real-life" problems in applied mathematics, in particular problems that do not have a closed-form solution. Contributions on both initial-value problems and boundary-value problems in ordinary differential equations appear in this volume. Numerical methods for initial-value problems in ordinary differential equations fall naturally into two classes: those which use one starting value at each step (one-step methods) and those which are based on several values of the solution (multistep methods). John Butcher has supplied an expert's perspective of the development of numerical methods for ordinary differential equations in the 20th century. Rob Corless and Lawrence Shampine talk about established technology, namely software for initial-value problems using Runge-Kutta and Rosenbrock methods, with interpolants to fill in the solution between mesh-points, but the 'slant' is new - based on the question, "How should such software integrate into the current generation of Problem Solving Environments?" Natalia Borovykh and Marc Spijker study the problem of establishing upper bounds for the norm of the nth power of square matrices. The dynamical system viewpoint has been of great benefit to ODE theory and numerical methods. Related is the study of chaotic behaviour. Willy Govaerts discusses the numerical methods for the computation and continuation of equilibria and bifurcation points of equilibria of dynamical systems. Arieh Iserles and Antonella Zanna survey the construction of Runge-Kutta methods which preserve algebraic invariant functions. Valeria Antohe and Ian Gladwell present numerical experiments on solving a Hamiltonian system of Hénon and Heiles with a symplectic and a nonsymplectic method with a variety of precisions and initial conditions. Stiff differential equations first became recognized as special during the 1950s. In 1963 two seminal publications laid to the foundations for later development: Dahlquist's paper on A-stable multistep methods and Butcher's first paper on implicit Runge-Kutta methods. Ernst Hairer and Gerhard Wanner deliver a survey which retraces the discovery of the order stars as well as the principal achievements obtained by that theory. Guido Vanden Berghe, Hans De Meyer, Marnix Van Daele and Tanja Van Hecke construct exponentially fitted Runge-Kutta methods with s stages. Differential-algebraic equations arise in control, in modelling of mechanical systems and in many other fields. Jeff Cash describes a fairly recent class of formulae for the numerical solution of initial-value problems for stiff and differential-algebraic systems. Shengtai Li and Linda Petzold describe methods and software for sensitivity analysis of solutions of DAE initial-value problems. Again in the area of differential-algebraic systems, Neil Biehn, John Betts, Stephen Campbell and William Huffman present current work on mesh adaptation for DAE two-point boundary-value problems. Contrasting approaches to the question of how good an approximation is as a solution of a given equation involve (i) attempting to estimate the actual error (i.e., the difference between the true and the approximate solutions) and (ii) attempting to estimate the defect - the amount by which the approximation fails to satisfy the given equation and any side-conditions. The paper by Wayne Enright on defect control relates to carefully analyzed techniques that have been proposed both for ordinary differential equations and for delay differential equations in which an attempt is made to control an estimate of the size of the defect. Many phenomena incorporate noise, and the numerical solution of stochastic differential equations has developed as a relatively new item of study in the area. Keven Burrage, Pamela Burrage and Taketomo Mitsui review the way numerical methods for solving stochastic differential equations (SDE's) are constructed. One of the more recent areas to attract scrutiny has been the area of differential equations with after-effect (retarded, delay, or neutral delay differential equations) and in this volume we include a number of papers on evolutionary problems in this area. The paper of Genna Bocharov and Fathalla Rihan conveys the importance in mathematical biology of models using retarded differential equations. The contribution by Christopher Baker is intended to convey much of the background necessary for the application of numerical methods and includes some original results on stability and on the solution of approximating equations. Alfredo Bellen, Nicola Guglielmi and Marino Zennaro contribute to the analysis of stability of numerical solutions of nonlinear neutral differential equations. Koen Engelborghs, Tatyana Luzyanina, Dirk Roose, Neville Ford and Volker Wulf consider the numerics of bifurcation in delay differential equations. Evelyn Buckwar contributes a paper indicating the construction and analysis of a numerical strategy for stochastic delay differential equations (SDDEs). This volume contains contributions on both Volterra and Fredholm-type integral equations. Christopher Baker responded to a late challenge to craft a review of the theory of the basic numerics of Volterra integral and integro-differential equations. Simon Shaw and John Whiteman discuss Galerkin methods for a type of Volterra integral equation that arises in modelling viscoelasticity. A subclass of boundary-value problems for ordinary differential equation comprises eigenvalue problems such as Sturm-Liouville problems (SLP) and Schrödinger equations. Liviu Ixaru describes the advances made over the last three decades in the field of piecewise perturbation methods for the numerical solution of Sturm-Liouville problems in general and systems of Schrödinger equations in particular. Alan Andrew surveys the asymptotic correction method for regular Sturm-Liouville problems. Leon Greenberg and Marco Marletta survey methods for higher-order Sturm-Liouville problems. R. Moore in the 1960s first showed the feasibility of validated solutions of differential equations, that is, of computing guaranteed enclosures of solutions. Boundary integral equations. Numerical solution of integral equations associated with boundary-value problems has experienced continuing interest. Peter Junghanns and Bernd Silbermann present a selection of modern results concerning the numerical analysis of one-dimensional Cauchy singular integral equations, in particular the stability of operator sequences associated with different projection methods. Johannes Elschner and Ivan Graham summarize the most important results achieved in the last years about the numerical solution of one-dimensional integral equations of Mellin type of means of projection methods and, in particular, by collocation methods. A survey of results on quadrature methods for solving boundary integral equations is presented by Andreas Rathsfeld. Wolfgang Hackbusch and Boris Khoromski present a novel approach for a very efficient treatment of integral operators. Ernst Stephan examines multilevel methods for the h-, p- and hp- versions of the boundary element method, including pre-conditioning techniques. George Hsiao, Olaf Steinbach and Wolfgang Wendland analyze various boundary element methods employed in local discretization schemes.